From early spring when ice is still on the ponds to mid-summer we can hear the mating calls of frogs. Eight out of the 14 species of Ontario’s frogs and toads spend part or all of their lives at the Dufferin Marsh. Adult frogs are carnivores gobbling down hundreds of insects, fish, crayfish, worms and sometimes each other. Like people, they breathe with lungs but are also able to breathe through their skin. Their eggs are laid in water and develop into fish-like tadpoles that breathe with gills and eat plants. The Spring Peeper tadpoles pictured on the left are about 4-5 weeks old and less than 24 hours away from complete metamorphosis. Wood Frogs lay eggs while ice is still on the pond. Their tadpoles develop very quickly so are more successful than other frogs during dry conditions. They spend their summers and winters in the forest of field. Wood Frogs call in the marsh for only 7 to 10 days in mid April and sound like the soft quacking of ducks. 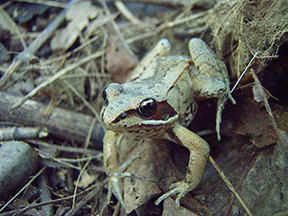 Click here to listen to the Wood Frog's call. The Spring Peeper is one of the first frogs to call at the Dufferin Marsh in the spring. It sounds just like its name… peeeeeep! 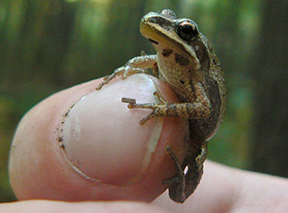 This little frog is about the size of your thumbnail; but in a chorus, they can sound louder than a jumbo jet! In the summer this frog lives in the forest and is able to climb trees in search of insects. It crawls under leaves for the winter. 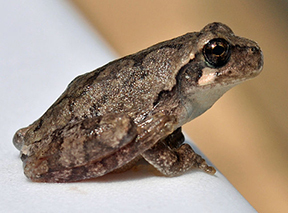 Click here to listen to the Spring Peeper's call. Click here to listen to a different version. Click here to listen to a chorus of Spring Peepers. 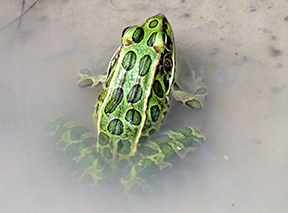 Leopard Frogs are a mid-sized frog, often bright green with distinctive gold outlined black spots. Their call is a soft snoring sound followed by a chuckle. Their main home is the pond but they can range thought the fields and forests in the summer looking for food. They bury in the pond muck to spend the winter. Click here to listen to the Leopard Frog's call. Pickerel Frogs are uncommon the the Dufferin Marsh but are sometimes heard in the spring. Adults usually live in or beside cold water ponds or streams; however females can seek out warmer waters for laying eggs. These frogs feed on land but find protection in water so don not stray very far from the bank. They look and sound similar to the Leopard frog. 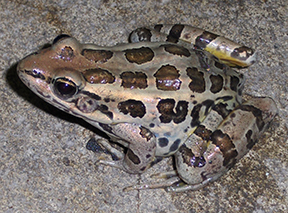 Click here to listen to the Pickerel Frog's call. Chorus Frogs start to call on the first warm night of spring. Their call sounds like a finger nail dragging over the teeth of a comb. Not much larger that the peeper, it shares a similar life cycle and habitat requirement. 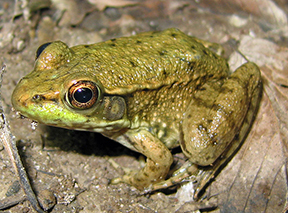 Although it is one of the most common frogs in the Dufferin Marsh it is considered a threatened species in Ontario. Click here to listen to the Chorus Frog's call. Green Frogs are the largest of the frogs at the Dufferin Marsh. They stay at the pond all year. They are the last species to breed and the males set up mating territories in the water that they defend aggressively. These frogs are very active during the day and the easiest to see. 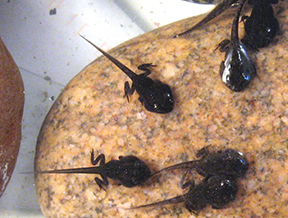 Their large tadpoles take two years to develop into adults. The call of the green frog is a loud glump like the plucking of a banjo string. Green frogs have been known to eat things as large as fish or other frogs. Click here to listen to the Green Frog's call. Grey Tree Frogs are great climbers with little suction cups on the end of each toe. In the late spring they visit the pond to lay eggs, calling a mate with a short loud trill They spend most of their lives i the forest and can change colour from dark grey to bright green to blend into their surroundings. ﻿Click here﻿ to listen to the Grey Tree Frog's call. By mid spring American Toads are at the pond trilling to attract a mate. The trilling call of each male has a unique pitch so that individuals can be distinguished. Eggs are laid in a pond or puddle and the little back tadpoles develop into tadpoles in just a few weeks. Sometimes you can see hundreds of tiny toads emerging from the pond heading off across the land to their new home. They will not return to the pond until the following spring preferring a field, forest or your garden to find food and over winter. Click here to listen to the American Toad's call.